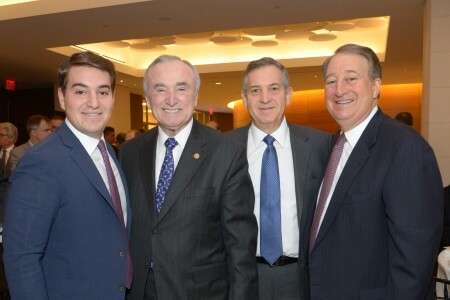 New York Police Commissioner William Bratton spoke at the Milstein Criminal Justice Policy Forum of the Citizens Crime Commission on February 7, 2014, and told the audience to expect a host of changes at the New York Police Department. Howard Milstein introduced Commissioner Bratton, and the meeting was hosted by Citizens Crime Commission President Howard Aborn. Among the changes Commissioner Bratton promised were that the controversial “stop-and-frisk” program will be reviewed and officers trained to follow the law to the letter. Technology will be employed to make the NYPD more open and transparent. “There should be no secrets in the NYPD,” Mr. Bratton said. “We’re going to do more to open up the organization.” Mr. Bratton has a Twitter account and plans to add an information technology officer to the department. And each new officer will be given a mentor to instill good habits, as Mr. Bratton himself was mentored when he joined the Boston police force. “The habits of a lifetime are formed in those first few months,” he said. “My goal is to get every New York recruit a perfect partner.” The idea behind assigning rookies to more experienced police officers comes from the public reaction to Operation Impact, which brought large numbers of police to high-crime neighborhoods. Crime went down, but some saw the tactic as heavy-handed. “The patient was inarguably getting better—the tests showed it,” Mr. Bratton said, “but the patient didn’t feel better. The commissioner’s plan to make the department more transparent will include the physical space inside NYPD headquarters at One Police Plaza, which could host meetings of police unions and fraternal organizations. Mr. Bratton also said he’s ordered a detailed review of how crime victims interact with the department, in order to improve their experience. “That includes everything from how 911 operators respond, to the actions of responding officers and investigators, to how victims retrieve their property, to prosecution, to everything in between,” he said. Improving victims’ experience will, he said, foster greater cooperation with the public, and, ultimately, improve the public’s trust in the NYPD. Commissioner Bratton was appointed by Mayor Bill de Blasio to the position that he held from 1994 to 1996 under Mayor Rudolph Giuliani. He led the Los Angeles Police Department from 2002 to 2009, where he was credited with improving relations with the city’s minority communities and reducing violent crime. Since 2002, the Citizens Crime Commission of New York City has presented a series of Criminal Justice Policy lectures sponsored by the Howard and Abby Milstein Foundation. Each event features a nationally prominent speaker who addresses the Crime Commission on such issues as crime, criminal justice, or terrorism. The formal remarks are followed by a question-and-answer period. Each meeting is open to the media. Each lecture is printed and distributed to top business, civic, and law enforcement leaders. The Citizens Crime Commission of New York City is a nonpartisan, nonprofit organization, working to make criminal justice and public safety policies and practices more effective through innovation, research, and education. In the last three decades, the Crime Commission has been a leader on such key issues as increasing the size of the NYPD, expanding the use of DNA evidence in crime fighting, creating innovations that reduce juvenile crime, developing interventions against gun violence and illegal gun crime, highlighting the changing nature of terrorism, and raising awareness about the threat of cyber crime. 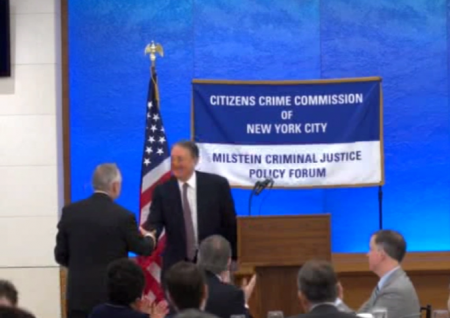 Howard Milstein introduces New York Police Commissioner William Bratton at the Milstein Criminal Justice Policy Forum on February 7, 2014.